The Burj Dubai tower, the tallest skyscraper in the world, is about to be completed. To celebrate it, David Hobcote has taken a series of amazing high resolution pictures from the air which give an exact impression of the breathtaking, massive scale of this building. Inside, it looks like a set from Blade Runner or the interior of the Death Star. Updated: David Hobcote told us how he did these great photos and gave us some amazing general shots that look like a next-gen SimCity. 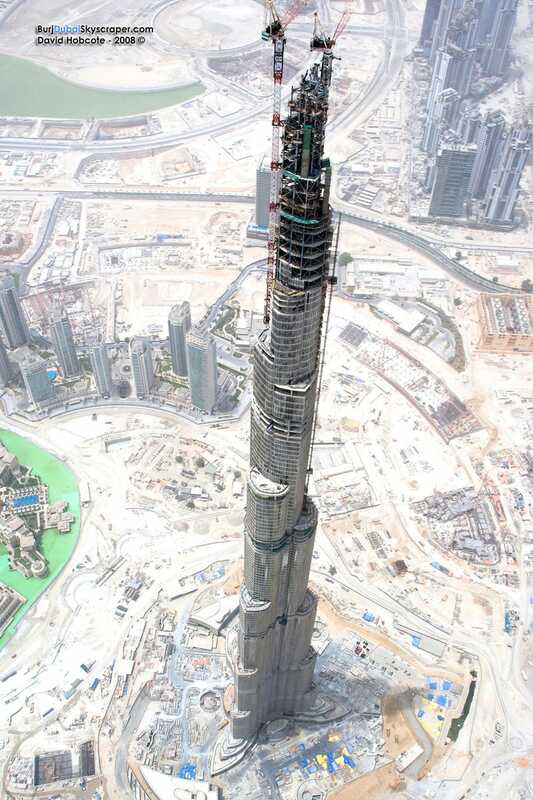 I took these photos from a bell helicopter last week on a trip to see this amazing building in Dubai with my son. They were taken on a 45 degree bank over the tower on a canon 1Ds mark 3 digital camera NO GOOD FOR THOSE AFRAID OF HIGHTS !! The interior shot however is not the Burge Dubai but the Arab Emirates Towers shot from the 10th floor bar looking up to the upper floors also took the attached shot looking out from the window across the street with the reflection of the interior in the window cool.